“Reservation”: the purchase number issued by or on behalf of the company, which entitles the tourist flight chosen by its holders. “LNA”: are the abbreviations of Law 48/1960, of July 21, on Air Navigation. “ICAO”: these are the acronyms of the International Civil Aviation Organization. “Helitaxi”: means the air transport between the airport of departure and that of the destination. “Tourist flight”: flight with the same aerodrome or heliport of departure and destination. “Company”: means a company whose business is air transport. “Applicant”: person who makes the reservation. “Passengers”: persons who perform the flight. “Passage”: means a group of passengers making the flight having a unit character in the reservation and in flight. (IV) the regulations that are applicable at any time. 3. Reservation. The reservation will be valid only for the flight indicated in the same, being necessary that the flight corresponds with the reserved one. 3.1 Requirements for the reservation: The reservation of the flight is confirmed when the Company issues the reservation, not requiring further confirmation of the flight. – Changes to the reservation must be made in advance of at least three (3) days at the beginning of the flight. No change will be admitted after three days. – The change of date of the contracted service will be allowed provided the new proposed day is within 6 months after the date of the flight of the initial reservation. – Reservations with offer and discounts can not make date changes. – No changes can be made with respect to the points of departure or destination. – Changes may be made to the reservation regarding the holders of the service on the day of the flight. 3.3 Cancellation of the reservation: The cancellation of the flight by the applicant will not mean any refund or compensation by the Company. 3.4 Payment: The price of the reservation, as well as taxes, fees, management fees, and any other amounts related to the reservation, must be fully paid at the time of confirming the reservation. In the event that such payment is not verified, it will be understood that the contract has not been concluded and these conditions will not apply. 4.1 General: The price of the reservation does not include the ground transportation service, except when the Company expressly offers it. The price of the reservation will be the price set by the Company at any time. 4.2 Taxes and fees: The Company will add to the price of the reservation the taxes and fees established by the competent authority at any time, which will be borne by the passenger. These taxes and rates are subject to modifications outside the Company, which may occur after the reservation. 4.3 Non-use of the flight: Except as stipulated in these conditions, the non-use by the passenger of the contracted flight at the relevant time will not generate any obligation for the Company to refund or refund the reservation, its fees, management expenses , Taxes or any other amount paid by the applicant to the Company relating to the contracted flight, or any other compensation or compensation. 5.1 There are limitations on flying over inhabited settlements with more than 50,000 inhabitants. In these cases the flight is limited to make a circumvallation of the chosen population in order to respect the current regulations. 5.2 At all times, strict observance of the limitations in the airspace established on a regular basis by the competent authority and those established by law or regulation shall be maintained. 5.3 Particular attention will also be given to any limitations in the airspace that are exceptionally established by the competent authority. In these cases, and having a reservation already formalized, a date of consensus will be sought to carry out the flight. 6. Timetables, delays, diversions, substitution, cancellation of flights and passengers not admitted to boarding. 6.1 Schedules: at any time after booking a flight, the Company may change schedules and / or cancel, terminate, divert, postpone or delay any flight if, in the judgment of the commander, this is done with just cause Or for safety reasons. 6.2 Delays: if the Company anticipates the delay of a flight with respect to the departure time of more than three hours, the applicant may suspend the flight at no cost. 6.3 Detours: in case it is necessary to divert the flight, the Company will be in charge of proposing new alternatives, without any additional cost. 6.4 Replacement of flights: if deemed necessary, the Company is entitled to have it replaced by other Companies, as well as to use helicopters other than those originally planned to operate the return flight. 6.5 Cancellation of flights: In any case, the Company shall not be obligated to pay any compensation to the passenger or the applicant when the cancellation has been caused by adverse weather, war, acts of terrorism, acts of God, altercation, demonstrations and any other matter Public order, technical problems affecting the aircraft, and failures in air traffic control, fire, flood, earthquake, earthquake, natural disaster, epidemic and other restrictions caused by a quarantine statement, acts derived from an authority Labor disputes, failures in supplier or subcontractor supplies, and any other extraordinary circumstance that could not have been avoided even if reasonable steps were taken. Likewise, the Company will not be obliged to pay the compensation when it has informed the cancellation of the flight at least one day in advance with respect to the expected departure time. 7. Compensation, reimbursement, alternative transportation and care measures. Compensation measures: in cases of adverse weather, war, acts of terrorism, acts of God, altercation, demonstrations and any other matter of public order, technical problems affecting the aircraft, and failures in traffic control Air pollution, fire, floods, earthquakes, earthquakes, natural disasters, epidemics and other restrictions caused by a quarantine declaration, acts of a competent authority, strikes and labor problems, supplier or subcontractor failures , And any other extraordinary circumstance that could not have been avoided even if you have taken reasonable steps, passengers / applicants will be entitled to change the day or the return of the reservation. 8.1 General: The passage shall be limited to the technical characteristics of the hired helicopter. 8.2 Hand baggage: passengers may carry binoculars in the cabin of the aircraft. These conditions are subject to space availability. 8.3 Animals: The Company does not allow pets. 9. The Company’s right to deny transportation to passengers and transportation restrictions. (I) It is necessary or convenient for safety reasons. (II) It is necessary or desirable because of the conduct, state, age or physical mental condition of the passenger. (III) It is necessary or convenient to avoid injury, discomfort or inconvenience of other passengers or crew. (IV) It is necessary or convenient because the passenger has not complied with the rules of the Company. (V) The passenger has presented to the Company some document acquired illegally, that has been denounced as lost or stolen, or that is allegedly false or contains modifications or alterations of any type not made by the Company. In these cases, the Company reserves the right to retain such documents. (VI) Persons present at the Company’s counter do not correspond with the holders of the reservation. In this case, the commander reserves the right to withhold such reservation. (I) The Company will not accept as passengers passengers under 14 years of age who are not accompanied by a passenger over 16 years of age (to whom family bonds are attached), who will assume full responsibility of the minor. The companion must be included in the same reservation. (II) The Company will not accept passengers suffering or likely to be suffering from serious infectious diseases, such as serious respiratory infections, tuberculosis, or pneumonia. (Iii) the Company will not accept a ticket whose average exceeds 80 kg per passenger. 10. Conduct on board the aircraft. 10.1 If, in the Company’s judgment, the conduct of the passenger on board the aircraft may endanger the aircraft or any person or property on board the aircraft, or obstruct the crew’s performance, or If he fails to comply with any instruction on the part of the crew, or threatens, abuses or insults any member of the crew, or behaves in a scandalous manner or any other that may be considered offensive to other passengers, Necessary to prevent such behavior from continuing, including moderate physical restraint or landing of the aircraft. 10.2 If the Company decides, in a reasonable exercise of its discretion, to divert the aircraft in order to disembark the passenger, the latter shall pay the Company all the expenses and costs resulting from such diversion. 10.3 With the express prior permission of the Company, it is forbidden for safety reasons to use any type of electronic device or similar device on board an aircraft. Equipment and devices whose use is prohibited are, without limitation, portable radios and recorders, mobile phones, portable computers, audio tape players, compact discs, DVD and / or MP3 players, electronic games and transmission devices ( Including toys with remote control and portable transceivers). 10.4 The consumption of alcoholic beverages is not allowed. 10.5 Smoking is not permitted on board. Limitation of liability in case of accident: the liability of the carrier in the event of an accident shall be governed by the provisions of Regulation EC 785/2004. Babies or children under 2 years. Passengers with reduced accessibility, please inquire. Shipment will start 20 minutes before departure time. Passengers not presented 10 minutes before departure will be denied boarding. These passengers will not be entitled to any refund or change of route; Must buy a new reserve. The compensation will be paid, in agreement with the passenger, directly on your credit card or through other means, in cash, travel vouchers, etc. 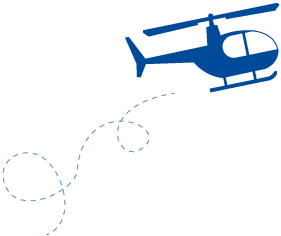 – The passenger must appear 20 minutes before the scheduled time of the flight to the heliport origin that appears in the reservation. – The passenger will carry the reservation with his corresponding purchase number and the DNI with photo.